James Samme scored a try and set up another. Dewsbury Moor celebrated reaching the Coral Challenge Cup third round following a terrific 20-16 victory away to East Leeds last Saturday. 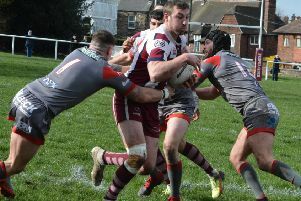 The Maroons had beaten their opponents twice last year in the league but knew it would be a tough task facing a much improved East Leeds team. Moor led after 10 minutes when James Samme took on four defenders before shaking free and releasing the ball for unmarked winger Sam Thornton to dive over in the corner. Ineson missed the conversion. Moor were then victims of an over officious referee which saw East Leeds receive five penalties on the bounce, actions that also saw the Maroons on a team warning, and the pressure told with an equalising try. James Delaney was introduced after 20 minutes and made an immediate impact, bursting through tackles before drawing the full-back to send Jordan Foster racing clear. He was caught short but managed to slip the ball to Samme and he dragged two defenders over the line to score between the posts. Brad Foster took over the kicking duties to convert. East Leeds were awarded a further penalty and Ineson was sin-binned for questioning the decision and the home side pulled a second try back to trail by two points at half-time. Moor found a bit of class five minutes after the re-start and after strong carries by Brad Adams and Pete Robinson the ball was quickly moved out to the right and centre AJ Boardman powered over out wide. Foster landed a brilliant conversion and Moor led 16-8. Frustration continued to boil for Moor as decisions went against them and Thornton had two tries chalked off for forward passes. The worsening conditions meant for a tough battle and the big East Leeds pack helped them pull a third try back. Moor kept working hard and great play by Archie Bruce saw him link with Ineson to put Boardman in for his second try. Foster’s conversion was narrowly wide but Moor led 20-12 with 10 minutes to play. Moor kicked off deep and found the resolve to dig in and a big hit by Adams saw the ball spilled and Moor received possession with the experience of Jake Richardson, Bartley O’Brien, Robinson and Delaney seeing the game out. Moor dug deep and although not at their fluent best, showed the heart and fight to book a third round spot. Jamie Samme was MoM closely followed by Dom Horn and Jordan Foster who was reliable as always at full-back.